Introducing Blue. 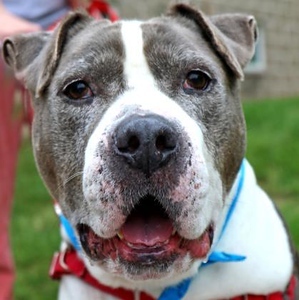 If you are the type of family that enjoys having a large, mature dog in your lives, then consider taking Blue home. Although this 7-year-old is still interested in playtime and his daily walks, he also appreciates quiet time. He can live in a single family home with adults and kids over 10 years old. He may be interested in sharing his new life with another dog but wants a cat-free home. Visit him in Newington and make his dreams come true. Remember, the Connecticut Humane Society has no time limits for adoption. Inquiries for adoption should be made at the Connecticut Humane Society located at 701 Russell Road in Newington or call toll free: 1-800-452-0114. Posted in Newington Town Crier, Newington News on Wednesday, 17 October 2018 14:43. Updated: Wednesday, 17 October 2018 14:45.